Home » Science » How do plants feed ? How do plants feed ? Have you ever wondered how plants feed themselves? Most plants create meals for themselves in the form of sugar. This process is called photosynthesis (‘photo’ meaning light and ‘synthesis’ meaning to make) in other words making food with light. Plants nourish themselves not only with nutrients found in the soil and water but also with the energy found in light. Just as some bacteria and algae do, photosynthesis is the way plants capture the energy of sunlight to produce food. 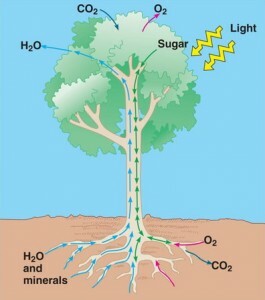 The process is rather complex but basically, plants convert CO2 (carbon dioxide) into carbohydrates(sugars) and oxygen with the use of water and energy (provided by light). During the day, light is absorbed by different pigments, especially chlorophyll. Chlorophyll is green in colour and hence that’s why most plants are green. So, photosynthesis produces the food energy (aka Carbohydrates), the plant then burns this oxygen during respiration, yes plants do ‘breathe’, to then release energy for living. 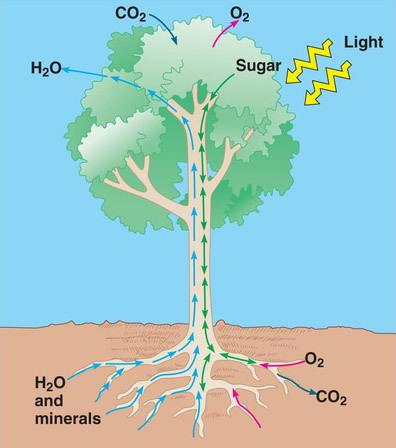 During plant respiration, the combining of the carbohydrates with oxygen are reduced to carbon dioxide and water, the reverse of photosynthesis. This process goes on night and day, but is counterbalanced by photosynthesis during daytime. Of course, plants also need small amounts of mineral nutrients they absorb along with water through their roots. Carnivorous plants have developed an original way of ingesting nutrients by capturing insects and feeding on their decomposing bodies. So whats the final balance – Do Plants produce more Oxygen than the consume ? So as we’ve seen plants create carbohydrates by taking in CO2 and light and giving off oxygen. CO2 is therefore removed from the atmosphere and Oxygen released. But when then respire the process is reversed they take in oxygen and release carbon dioxide – so whats the final balance of account? Photosynthesis produces a far greater amount of oxygen and sugars, etc. than the small amount the plant requires to produce its energy needs. OK – but only during the day when the sun light is available! During the night, the plant actually uses oxygen it has left over from the daylight photosynthesis or takes the oxygen from the air surrounding the plant to meet its energy needs.